UGUNĪ, the concluding exhibition of the residency programme by Latvian Centre of Contemporary Ceramics, is held in cooperation with Daugavpils Mark Rothko Art Centre. It is a joint project by three young ceramic artists who, for an entire month, worked side by side in Ceramic Laboratory in Daugavpils Fortress. A residency is a very special time and space where artists can be free from daily cares and worries, liberated from the trivia of organising their day-to-day lives. Instead, they are able to immerse themselves fully into creative processes, develop their skills and experiment with materials. It is a time for research, which often yields unexpected results that even the artist could not have hoped for. Daugavpils holds a special place among artist residencies owing to its advantageous location on the eastern border of the European Union, attracting artists as an ethnically and culturally appealing environment with long-established traditions where cultural interconnections are a matter of fact. Furthermore, Daugavpils Fortress, a former citadel where Ceramic Laboratory is situated, has a very special aura in its own right as a city within a city, steeped in history and creativity. 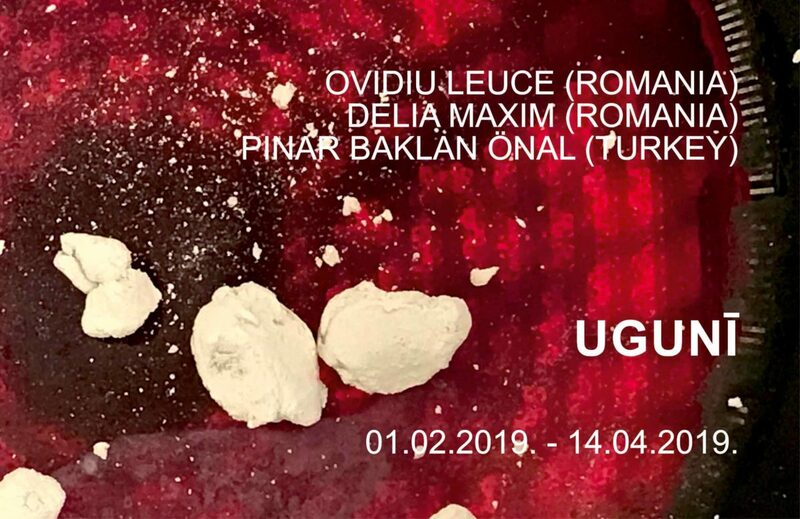 This time, the residency welcomed three artists – Ovidiu Leuce and Delia Maxim from Romania and Pınar Baklan Önal from Turkey – whose daily interactions inspired them to create a joint body of work to be showcased in this exhibition. As they work together, artists are faced with a very special challenge that requires surrendering the status of a solitary creator, becoming socially and artistically open to each other as well as welcoming spontaneous changes to their individual artistic styles. Choice of the title UGUNĪ, the expression in Latvian that is being translated as “IN FIRE”, was as spontaneous as the jointly created body of work, which is thematically and technically diverse but shares a joint creative spark. Ovidiu Leuce fashioned poetic collages from everyday objects. His work is dynamic and expressive. Its surfaces reveal traces of the artist’s fingerprints, which appears to be the very force that holds together these towering structures. The spontaneous and playful work by Delia Maxim is no less expressive – geometrically graphical sculptural images engage in an intense communication, inviting the viewer to use their imagination and envision these objects in motion. In a similar vein, communication and dialogue are the underlying themes in the work by Pınar Baklan Önal. For this exhibition, the artist created a group of fluid and mysterious forms where discrete objects become one, resonating in both form and contents. Elements of this group appear to merge into one, creating an illusion of a separate world and a different reality – they keep a secret only known to them, but everybody is invited to take a closer look and try to solve their mystery!